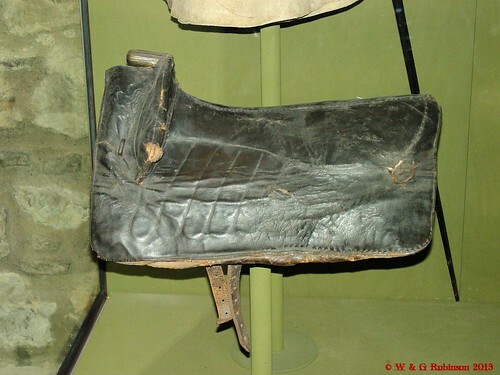 I grew up around horses and know which end the bit goes, but as they were all trotters, I’m not qualified to say much more than “here are some saddles”. I’ll be using proper names, so if you aren’t familiar with them, you may want to do a search on “saddle anatomy” or the problem words. Beware, the photos aren’t in chronological order of period, I’ve gone from simplest to most complex. As usual, clicking on the photos with enequinate and take you to larger views. 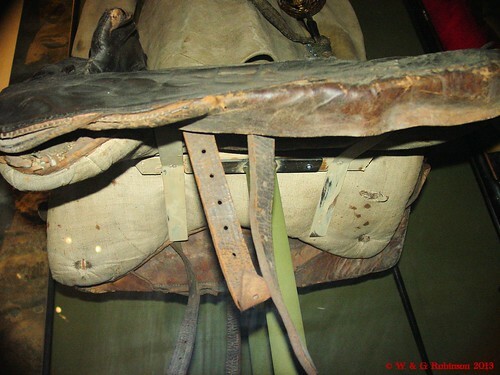 So, here are some saddles. 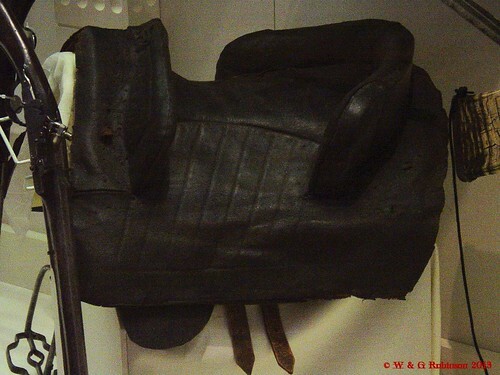 This first one is a late 17th century dragoon saddle from northern Europe in the Tower Armouries. The ascension number is VI.392 if you want to follow up with them. 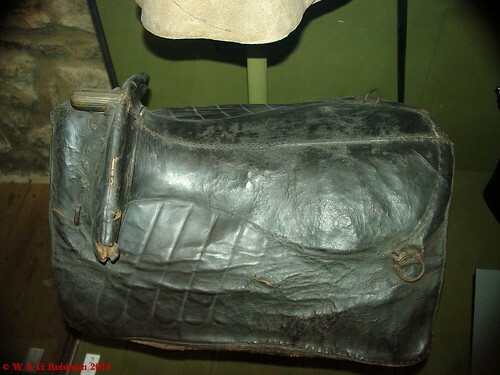 There are two ‘D’-rings at the front for attaching holsters and two rings at the back for a rolled cloak or valise. 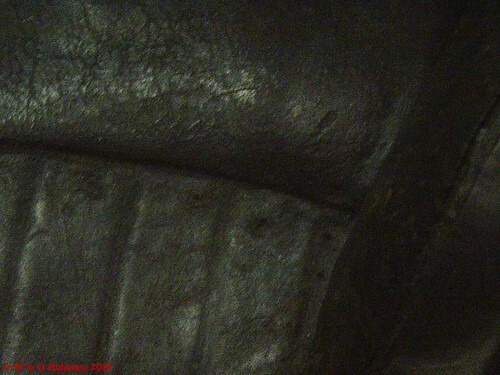 Close up of the pommel, showing the stitching and some hint of the construction. Orientation is the same as in the wide shot of this saddle. 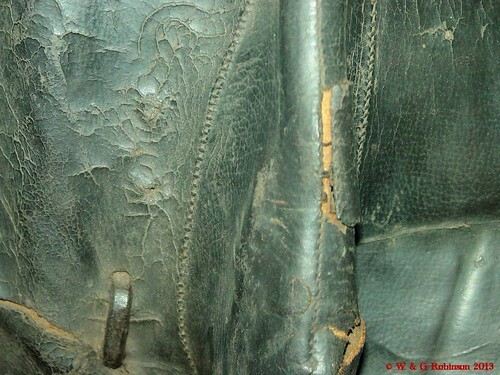 The pistol holster attaches to the ring in the lower left of the photo. 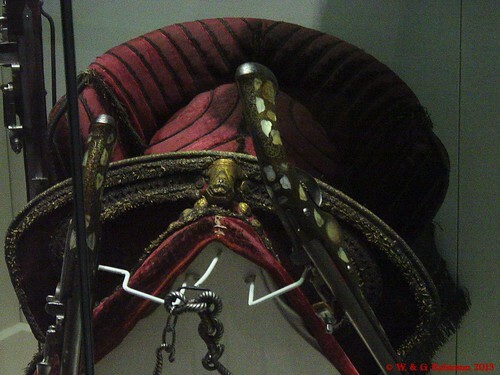 View from slightly above, showing seat shape and seam and the method of attaching the rings. The horn is brass. Lower side view, still from the on side. 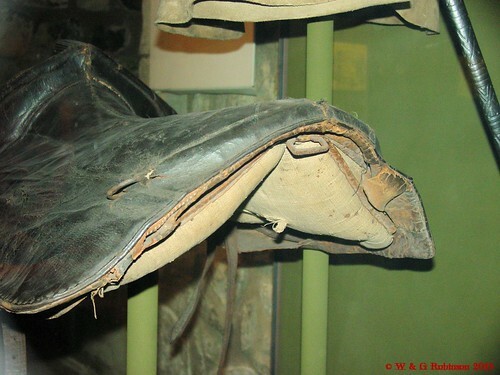 The padding and skirt stitching can be clearly seen. 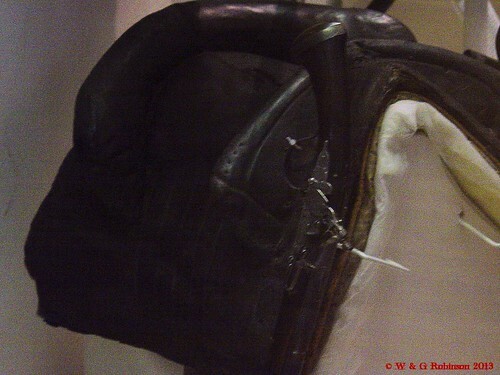 Front view showing the horn, pommel and both d-rings. That’s a buff coat cuff intruding in the top left of the frame. 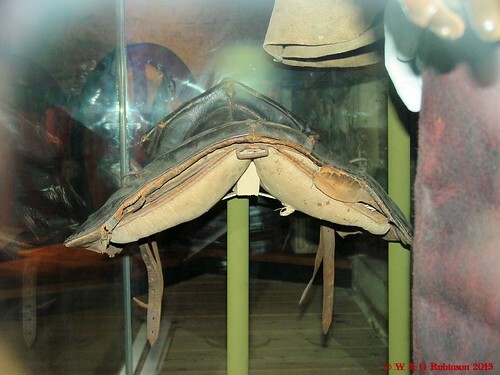 Rear view, showing the padding and crupper ring. 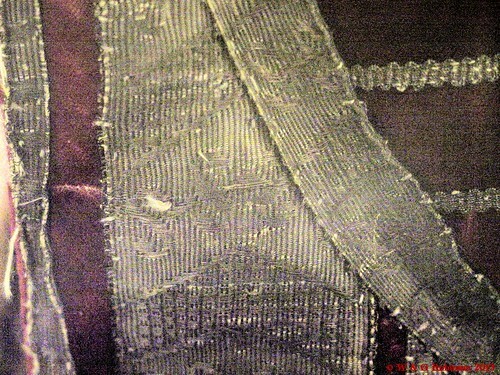 Three-quarter rear view showing stitching. The shape of the tree can roughly be inferred from the shape of the padding. 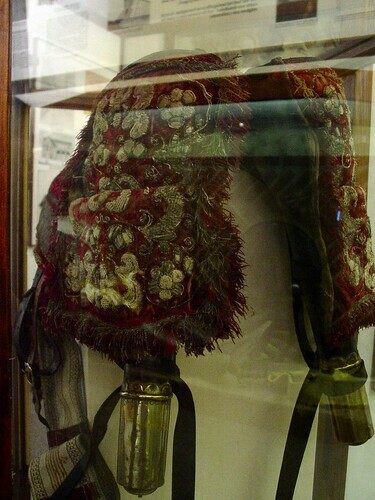 The second saddle is an English dragoon’s saddle from the mid 17th century, now in the Royal Armouries in Leeds. 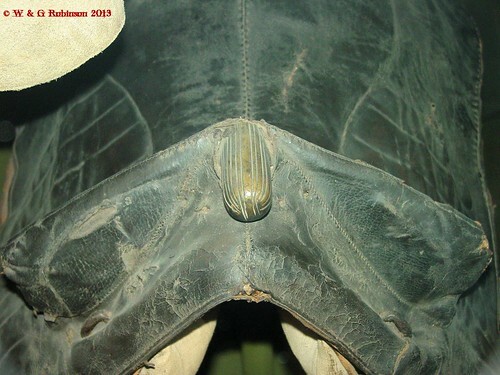 The main differences to the one above is the presence of the cantle and lack of a horn. You can see a small fender hanging down from under the skirt. 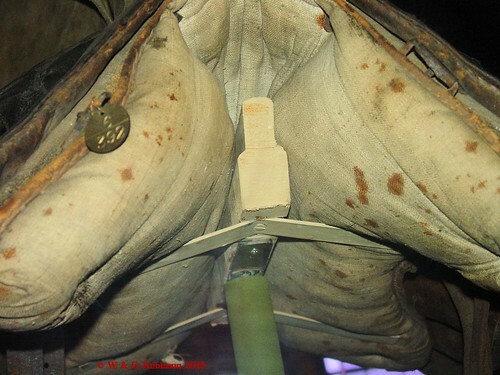 The attachment points for the pistol holsters can be seen at the front. Front view, the pistols are in the correct location, but the holsters are missing. Three-quarter view from the front, off side. 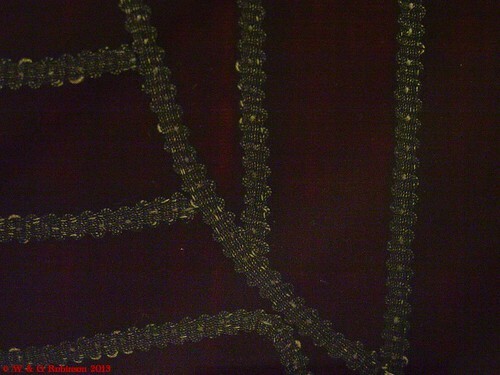 Details of the embossing on the seat jockey. This is the off side. 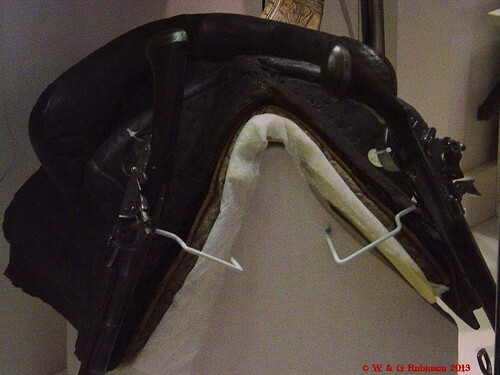 Third is an harquebussier’s saddle again in the Leeds Armouries. It’s contemporary with the one above and is also missing the pistol holsters. Off-side view. Materials are velvet, metallic silver braid and gilt brass nails over leather and wood. Front view, showing a small (once) silver-gilt brass horn, and the location of the pistols. The last one’s pretty top-shelf. It dates from the middle of the seventeenth century and was made for a member of the Hildyard family of Flintham, Nottinghamshire. It’s now in the Nottingham Castle Museum and Art Gallery, where it blurs the distinction between both. 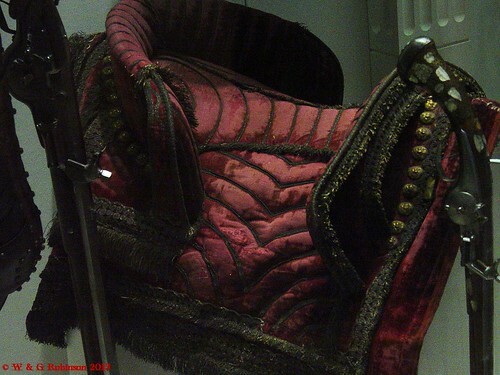 Materials are velvet, metallic silver braid, metallic silver thread, silk and gilt brass nails over leather and wood. And more silver braid. For a change, the pistol holsters are present, and made from all of the above with silver-gilt brass caps and more braid. 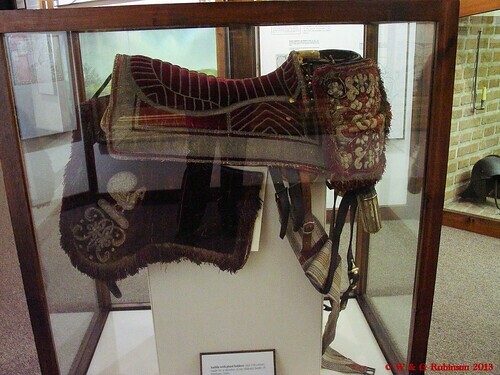 The pistol holsters, opus Anglicanum embroidery and the tack. Holster, off-side. Wow. Just wow. 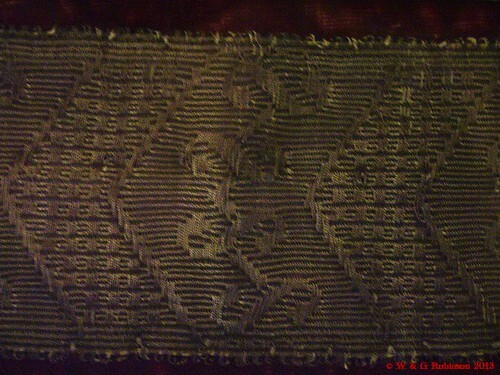 Detail of the braid towards the back of the seat. Even closer detail of the intersection of the back of the seat and the skirt. Excuse the low light. 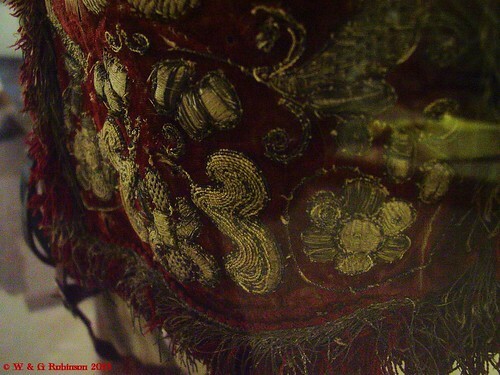 Lower edge of the skirt. Mostly all metallic silver wire.